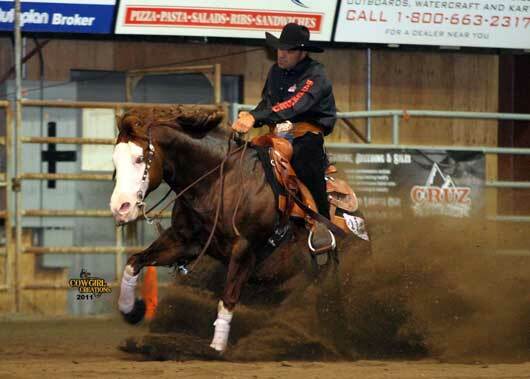 Marcelo Cruz, aboard Chics Loaded Gun, owned by Brian Knutson and Gaylene Sawchuck. 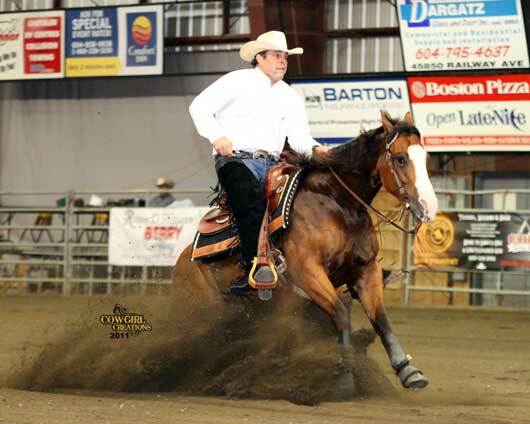 The 2011 West Coast Classic, a Western Canadian Reining Association NRHA affiliate series qualifier show held July 14-17 hosted extra classes this year with the cancellation of the Rockslide and Riverslide BC shows. Several horse and rider teams shared winning streaks for the top paychecks at this year’s Chilliwack reining show. Big winners included the husband and wife team, Marcelo and Amie Cruz of Langley, BC. Marcelo claimed the NRHA Novice Horse Open Level 2 on Lakota Chic, owned by Gaylene Sawchuk with a score of 71.5 and the NRHA Open 3 year-old Futurity Level 4 scoring 144.5, on Docs A Whizzin also owned by Gaylene Sawchuk. Aboard Chics Loaded Gun, Marcelo scored a 150 claiming the NRHA Open Derby 4,5,6 year-old Level 4 class. Wife Amie, rode with a score of 142.5 to tie with Wolfgang Winkler, riding Hollywood Chickadee and share the winning glory for the NRHA Limited Open Champion class. Scoring a 134.5 to win the NRHA Rookie Professional Class aboard No Sugarcoatin, owned by Larraine Petri. The NRHA Open class with a score of 145, went to Cheryl Mitchell and Loveable Nic owned by Rein Maker Inc. The team also toped the charts with a 148 score to win the NRHA Intermediate Open 4,5,6 year old Derby Level 3. Colonels Smokin Oak and David Goodchild, Non Pro Champions at this year's West Coast Classic. Colonels Smokin Oak rode and owned by David Goodchild scored a 146 claiming the NRHA Non Pro class. Team Goodchild and Colonels Smokin Oak also brought home the paychecks from the NRHA Non Pro 4,5,6 year old Derby Level 1 and Level 4 classes with a 144.5 and NRHA Intermediate Open with a 143.7 scored run. Results from this show are based on unofficial results.